Here are the makings of a homemade pad thai with my very own twist. 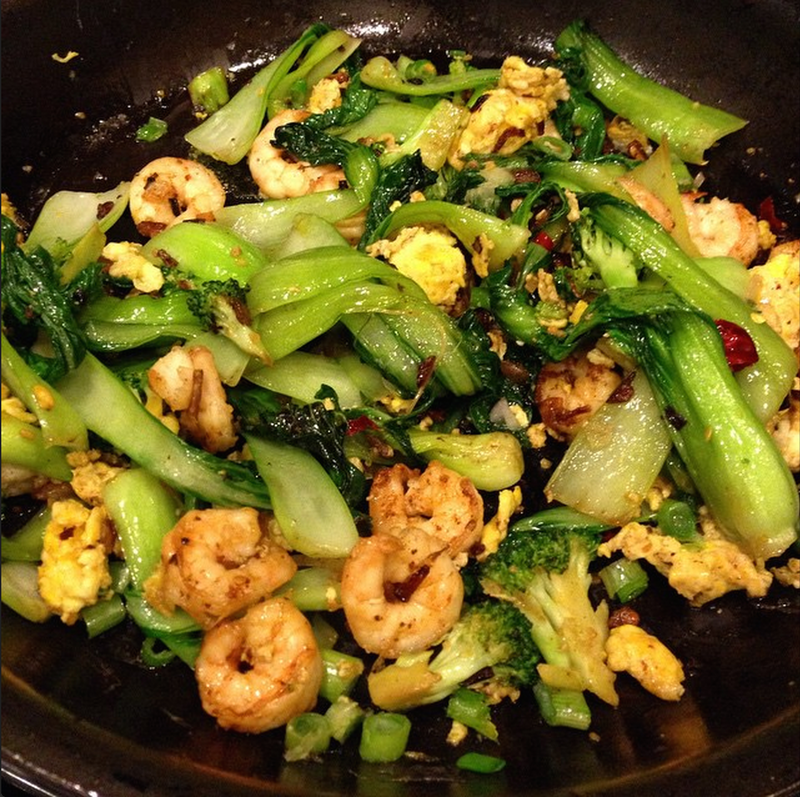 I like to load up on delicious green vegetables, so here I went heavy on the broccoli, bok choy, and green onions and added shrimp for protein. What I especially love about pad thai are the peanuts. I normally order a side of peanut sauce for my pad thai, but for this recipe I actually added peanut butter. I happened to have a fancy vanilla bourbon peanut butter, but I’m sure any smooth peanut butter will do the trick. 1. Heat a pot full of water for noodles. Cook noodles. When done drain, but set aside some water. Run cold water over the noodles. 2. Meanwhile, heat sesame oil and a little coconut oil in wok or large pan over medium high heat. Sautee garlic, bok choy, broccoli, and shrimp. Add salt and pepper. Flip shrimp after about 3 minutes and cook until opaque. Bok choy should be wilted and broccoli cooked. Transfer vegetables and shrimp to dish. 3. Add about a teaspoon more oil to the pan and add eggs. Scramble eggs and add noodles to the pan. Add fish sauce and peanut butter. Add shrimp, vegetables, and chilis and turn off stove. Mix everything, squeeze some fresh lemon or lime, and add more sauce and peanut butter to taste.